Day two of the Homes for Heroes Twelve Days of Christmas Miracles introduces you to a hero who resides in Texas, with a son who faces extremely difficult medical challenges. Homes for Heroes real estate specialist, Courtney Smith, nominated Jeff to receive a $500 Christmas Miracle gift to help with his son’s medical costs. In March 2018, Jeff’s son Dagan was diagnosed with osteosarcoma, a cancer that is normally found in a person’s arm and leg bones. Dagan had been having pain in his leg and the cancer was found in his thigh (femur) bone. Dagan was 10 years old at the time. Jeff and Dagan’s mother, Dana, have been unbelievably strong and committed to providing their family and friends updates on caringbridge.org. Jeff has spent countless hours driving back and forth from Texas to The St Louis Children’s Hospital in Missouri to handle all of the medical tests and procedures necessary to treat Dagan’s cancer. Dagan has been the strongest of them all. His attitude and faith are inspiring. Due to the fact that osteosarcoma cancer destroys the bone, Dagan underwent a unique surgery called Van Ness Rotationplasty to amputate the tumor from his leg. Dagan is now learning to walk with his prosthetic. His positive attitude has not changed. In November, Dagan finished his last chemotherapy treatment and is now home and waiting for the next test results. Homes for Heroes specialist, Courtney Smith, was honored to present a $500 check to Jeff, Dana and Dagan to help with all of the current and future medical expenses. 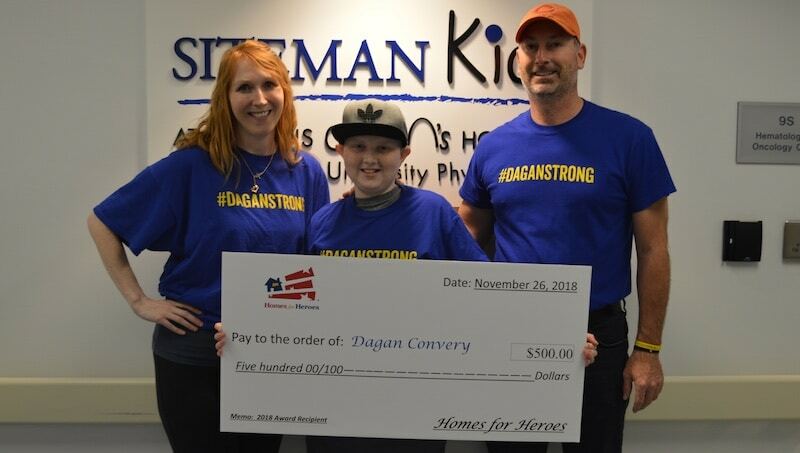 Courtney was able to work with St. Louis Children’s Hospital, and Desiree Williams, Stephanie Perry, and Whitney Kohlmeyer with the SLCH foundation to present the gift while the family was there for Dagan’s last treatment. Thank you to all who made this Christmas gift possible. And, Jeff, we all thank you for your service. 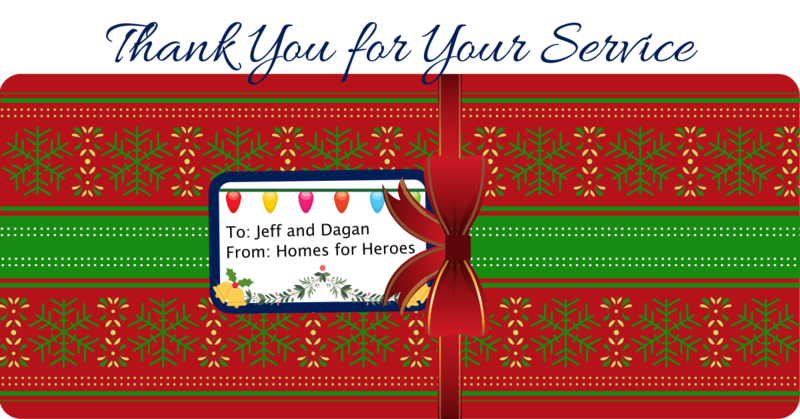 Happy Holidays and Merry Christmas to you, Dagan and Dana from all of us at Homes for Heroes.